San Francisco, we need your help! Did you know that 70% of kids quit sports due to high costs and excessive competitive pressure? When you play with us, part of your league registration cost goes towards providing equipment, fields, curriculum development, referees, and team shirts for every Volo Kid. 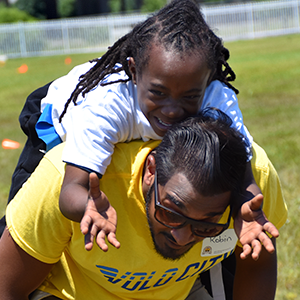 We play so kids can play for free; it’s what sets us apart. 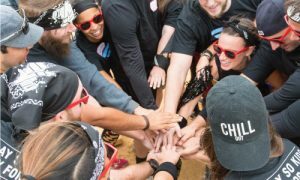 Where else can you play with your friends, meet new people, and make a positive change in your community? You’re already helping by playing with us, but there’s always more to do! The need for free quality sports for San Francisco youth is ever-increasing. That’s why we make it easy for you to donate via venmo @volocity-kids or online at kidsweek.volocityfoundation.org. What is the Volo Kids Foundation? The Volo Kids Foundation organizes free youth sports programs for kids ages 6-12. We remove barriers to entry by coming to the communities that need us, so that neither transportation nor cost ever stop a child from having access to sports. Since our inception in 2015, we have engaged over 700 kids and have impacted the lives of over 3,000 kids! Not only do our volunteers get to coach kids in the sports they love, but they can also play in any Volo league for free. Yes, you read that right – FREE leagues for volunteers! No time to volunteer? Donating via venmo @VoloCity-Kids and participating in Kids Week events are equally awesome ways to support our work. For more information on what you can do please ask your league host or check out www.volocityfoundation.org. We understand that life is busy, and as much as you want to volunteer consistently you may not have the time. That’s why we host tournaments and events throughout the year that are dedicated to raising money for the Volo Kids. Stay tuned to our social media to attend the next one! It costs $125 to provide a free sports program for 1 child for a 6 week season – you can sponsor a child by donating here today – don’t forget to donate to the San Francisco page so it counts towards our fundraising goal!